Extant Palaeognathae include the South American and Central American tinamous (Tinamidae) and the flightless ratites, i.e., the New Zealand Apterygidae (kiwis), the South American Rheidae (rheas), the African Struthionidae (ostrich), and the Casuariidae of the Australian region (cassowaries and emus). Recently extinct ratite taxa are the Aepyornithidae (elephant birds) of Madagascar and the Dinornithidae (moas) of New Zealand. Whereas monophyly of palaeognathous birds is supported by virtually all recent analyses, the relationships within the group are still controversial. Most authors (e.g., Sibley and Ahlquist 1990; Livezey and Zusi 2007) assumed sister group relationship between the Tinamidae and ratites, but analyses of nuclear DNA by Hackett et al. (2008) and Harshman et al. (2008) strongly supported a clade including tinamous, Casuariidae, and Apterygidae (see also Fig. 27.4 in Cracraft et al. 2004). If paraphyly of ratites is confirmed by future studies, flightlessness evolved independently within several palaeognathous lineages, as already assumed by some earlier authors (e.g., Olson 1985; Houde 1988; Feduccia 1999; contra Hackett et al. 2008, who considered an origin of the volant tinamous from a flightless ancestor). Studies of morphological data resulted in a sister group relationship between the Apterygidae and all other living ratites (see Fig. 7.2 in Lee et al. 1997; Livezey and Zusi 2007), but molecular analyses of both nuclear and mitochondrial sequences congruently supported a sister group relationship between the Apterygidae and Casuariidae (see Fig. 7.3 in Lee et al. 1997; van Tuinen et al. 1998; Haddrath and Baker 2001; Paton et al. 2002; Hackett et al. 2008). Apterygidae and Casuariidae share very short wings and reduced feather vanes, but kiwis (and moas) differ from other ratites in several presumably plesiomorphic features, such as the absence of supraorbital processes and the presence of a hallux. 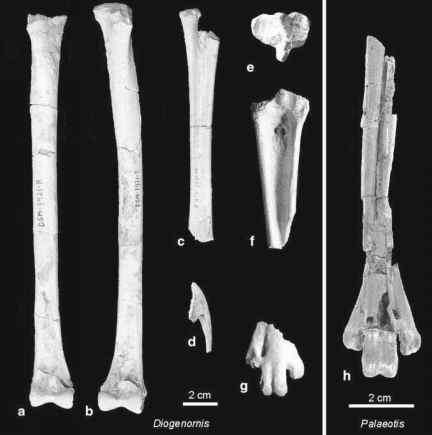 In contrast to that of other ratites, the distal tibiotarsus of the Apterygidae and Dinornithidae exhibits a supra-tendinal bridge. The distribution of extant palaeognathous birds is restricted to the Southern Hemisphere, but several fossil taxa were reported from the Paleogene of Europe and North America. Of the modern groups, however, only the Rheidae and Casuariidae have a Paleogene fossil record. The earliest unambiguous stem group representative of the Struthionidae is Struthio coppensi Mourer-Chauvire et al., 1996 from the early Miocene of Namibia. According to Mourer-Chauvire et al. (1996), the fossils of this species suggest that didactyl ostriches originated in Africa before the Miocene, from where they dispersed into Eurasia in the Neogene. The earliest fossil Tinamidae are from the Miocene of Argentina (Bertelli and Chiappe 2005). Eggshell fragments of putative Dinornithidae were reported from the early/middle Miocene of New Zealand (Worthy et al. 2007). Fossil Aepyornithidae and Apterygidae are so far only known from Quaternary deposits.